Representatives of the Highgate Forum and Highgate Society have been in discussions with TfL and the boroughs for some years over possible changes to the 271 bus route. TfL has now launched a consultation on a proposal. We strongly support this. We feel that the proposal now being consulted on by TfL (until 13 March) does all of that. In essence, it is proposed that the 271 shares the 214 terminus on North Road. (Scroll down for a plan.) The alternatives – to run the bus to the bottom of North Hill, run it round Castle Yard and Southwood Lane, stop it at the Whittington and stop it at Archway – each have supporters, but do come with greater issues of practicality, disruption or cost. The current 271 bus terminus is the only bus stop for the 271 in Highgate village for passengers heading south (the next being outside Channing School). This modest extension to the route will create 10 new interconnections for the 271 users (214 x 2, 210 x 2, 603 x 2 and 143 x4). This is the first step to better east-west connections. Between St Michael’s School and the Gatehouse, North Road is an urban freeway, not a pleasant village road. This proposal will see a more sympathetic look with new trees being planted and new road surfaces. The “motorway” will go and traffic speeds will fall. The current location of the 271 terminus is an eyesore. It blights the centre of Highgate village. Its removal will improve traffic flow as well as amenity. We propose to hold meetings to gather ideas of what to do with the space vacated by the terminus, and then consult, once the stop has moved. TfL has tested the turning of buses where the new roundabout would be located. If you have any questions or queries please contact the Highgate Society and Highgate Forum teams at info@forhighgate.org or fill in the comment box below. Historical footnote: The present 271 turn around was used from 1939, it seems, when the 611 trolleybus replaced tram no 11, the last to operate in north London. The 271 route itself has been running since 1960. The prime aim should be to slow and reduce the traffic flow through Highgate. If this proposal contributes to this, even if tangentially, then I shall certainly be in favour. To this end, the widening of the reservation, the planting of trees, and the straightening of the pelican crossing are all excellent suggestions (though they could be done irregardless of the 271 proposal). The loser appears to be Highgate School, which will have double deckers parked outside blocking its light all day long. I wonder what their view is. Also, no mention of the obvious alternative of a short extension of the 271 route up to Wellington Corner (or even East Finchley) and terminating there. There’s room surely. Finally, you mention ‘an improvement of traffic flow’ as a consequence of gaining the area at the trolleybus turnaround. I am not in support. If anything you should be looking at constructing a further impediment to traffic, perhaps by closing South Grove to through traffic (or at least creating a pedestrian friendly shared space) and allowing Pond Square to ‘expand’. Many thanks for your comments. Safer and slower traffic is a key aim and the “widening of the reservation, the planting of trees, and the straightening of the pelican crossing” etc will also make the area look much nicer. We don’t think Highgate School loses – they get a bus service which is very popular with students starting at their door (with far fewer road crossings for pupils who want to use it) and the buses are not that close to the windows (they’ll block much less light than the trees). Also there’s a great gain by not having the 214 turn outside St Michael’s primary where they have perhaps a couple of thousand pupil crossings each school day. 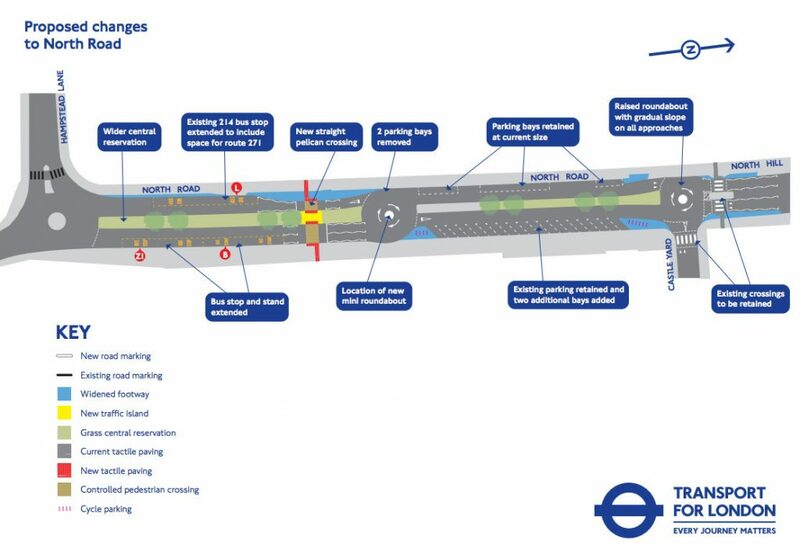 TfL ruled out “the obvious alternative of a short extension of the 271 route up to Wellington Corner (or even East Finchley)” on the grounds of cost. They also doubted that there would be much demand. We agreed to disagree! But it’s not an option now. There will be much discussion no doubt about what to do with the 271 terminus space but, one step at a time, we have to move the bus first! To express general support for the proposals, which seem well designed to achieve the stated objectives for the village and North Road. The raised roundabout at St Michael’s/Castle Yard should also make the Castle Yard pedestrian crossing safer from traffic turning right. The TfL map shows North Hill beginning at Castle Yard. It doesn’t. North Hill begins at High Point. North Road continues beyond St Michael’s/Castle Yard and should be treated as a continuation for amenity and traffic control purposes.. If this proposal goes ahead, after a year of agonizing roadworks and much expenditure, we will be shivering in the winds of North Road and longing for the relative comfort of the Pond Square terminus. And the bus drivers will have nowhere to go to the loo. Far better to spend less money improving the layout and accessibility at Pond Square. I suspect that man of those who clamour for change don’t actually use the 271.
who says it’s an eyesore – it’s a bus terminus for heaven’s sake. I suppose it is shop and cafe owners who want it shifted. So North road is to be dug up and a second roundabout added – great. As a user of the 271 I do not find the current location dangerous and it’s pleasanter waiting in the village than in North Road which is bleak and very dark also. Why should North Road have the 271 and the 214 buses parked there ? I strongly oppose this rather silly idea. Thank you for your comments. Just to note that you would be able, under the proposal, to catch the southbound 271 on the High Street where the 210 and 143 currently stop. That is one of the advantages of this change – those who want to get to Archway (and there many who go only that far) will be able to get any of the three buses from one stop. And, we are not saying that waiting at the current 271 terminus is dangerous – the danger arises for people walking in front of and behind the buses. I like the 271 terminus in the village. I do not think there is anything ugly about It. It’s a pleasant place to wait for a bus and to be dropped off. I am a regular user of all the buses that pass through the village. I would be equally happy if the 271 service was extended to East Finchley tube station where it could turn safely and link up with the other routes that pass there. Conversely, Wellington corner is not a safe place to terminate. I am a regular user of the 234 bus that terminates at this point and the driver has to make a dangerous manoeuvre when pulling out across two lanes of busy traffic to turn up Bakers Lane when heading north. I agree that the 271 terminus should move away from Highgate Village, but to move it to North Road, I believe, would be a missed opportunity. The ideal to change North Road from being ‘an urban freeway’ into ‘a pleasant village road’ cannot be fully realised if an additional bus terminal is part of the plan? (and what a great shame for the residents of this section of North Hill who would now find double-deckers added to their view). I propose, therefore, to extend both the 214 and 271 bus routes. A more obvious choice for the 271 terminus, practically, aesthetically and less visually damaging for any Highgate resident, is to run it on down to Wellington Roundabout which not only has a bigger turning circle but also has a more appropriate bus stand, outside a commercial premises (Jewson). At the same time transport links could be improved to Muswell Hill by extending the 214 bus route. Residents of Dartmouth Park and those west of Highgate Village are poorly served for transport beyond Highgate; the 214 terminates on North Road and the C2 terminates at Parliament Hill Fields whereas, residents on the east of Highgate Village can travel to Muswell Hill on the 134 and 43 and even further afield as far as Brent Cross on the 210 and 43. How disappointing – I was hoping the 271 would come right down north hill and give us a regular and frequent service to the archway. The 143 service is very sparce and erratic. Can we not have a turnround at Aylmer Rd , giving us a good service to the south? Hello and thanks for your comment. This option was certainly our first choice but we were defeated on two counts: the combination of cost (which was quite high, extra buses to keep frequency) coupled with an expectation of very few new passengers. We disputed the latter but of course have little evidence. At some point in the 80s/90s the route did, on Sundays, run through Highgate and beyond so there is a precedent and we have not given hope one day of extending it. But for now it is this or nothing! I’m bemused by the aim of slowing traffic in Highgate. How can it get any slower when every school day morning there is often gridlock on Hampstead lane, north hill and Highgate hill? Surely, these proposals are going to make traffic problems much worse and the more gridlock and traffic jams there are, the more pollution. I think the bus terminus on north hill is an awful idea, it is an inappropriate space which is currently occupied by residents and school children. How is this beneficial to them? It is currently a very short walk for pupils to the current bus terminal so the benefit of having a bus terminal slightly closer is greatly outweighed by the children and residents having large double decker buses obscuring their buildings and homes. Furthermore, trying to squeeze a third roundabout in a small stretch of road where buses already struggle to turn around is a recipe for traffic congestion disaster. If the aim is to move the bus terminal then move it somewhere far more appropriate. The plans do not have my support as all I can see is traffic mayhem! As an aside, better links with Hampstead and West Hampstead area are needed. Hello and thank you for your comments. You raise a few points that deserve explanation, if I may? On traffic speeds – there are times of the day when the roads are clogged and times when traffic moves freely. The slowest traffic is during rush hour and school run times. To reduce that problem we need to make bus services as attractive as possible to encourage people to use them, to get cars off the road, and that is one aim (better interconnections and easier east-west movements) of this plan. Council surveys show that when traffic moves freely, some cars go at 50mph+, and it is those cars we are trying to slow down to make North Road safer. As to an alternative location for the terminus ….. our hopes had been to move the 271 to the bottom of North Hill to join the 234 but TfL has made it clear that the money for that is not available at the moment. The proposal is a step in the right direction and the start not the end. please can Simon Briscoe explain why if TFL says there is no money to make changes for route 271 to share the terminus with 234 then where is the money coming from for this project? Surely in these times of austerity this money could be better spent elsewhere?The creation of a bus terminus opposite a school with some 1000 plus pupils who move between sights seems dangerous. North Road and North Hill are already hugely congested areas and this will add to the congestion. The current location of the terminus in the village means that buses are at least tucked away off the main road – this proposal will result in a bus terminus situated on an already congested main road. It will be very dangerous for the children of the school. Hello. You will have to put detailed questions about costs etc to TfL. I am just a local resident who has been involved with this – it’s not my scheme! But on money, the big cost is not what you might call the capital cost of painting lines on the road, planting trees, resurfacing, altering curbs etc. These sums are modest money in the TfL context. The real cost of moving the turning point to the bottom of North Hill is the extra buses (two I think) and drivers, and fuel etc that would then be required to maintain the service frequency. That would be a hefty six figure sum every year compared to a much more modest five figure sum spent once for the current scheme. Presumably (though I do not pretend to know) the one-off costs of extending the route would not be the barrier to change. It is for this reason that one of the many options that had been on the table (suggested by Highgate residents) was to run alternate 271 buses to join the 234, stopping the others at Archway. That would have been cost neutral but was not seen as desirable by TfL. The TFL proposal is riddled with problems that do not appear to have been addressed.To move the 271 terminus from an off street location amongst shops to a main thoroughfare which is residential, particularly by positioning it outside the entrance to Highgate School, makes no sense and will increase already high levels of pollution and risk the safety of thousands of school children as they are bound to try to cross between the parked double deckers.As well as the inevitable increase in the traffic jams in North Road at peak times often extending into North Hill and Hampstead Lane, no account is taken of delivery lorries and tankers to The Red Lion and Sun and the petrol station if the road is reduced to single lanes. Residents will have great difficulty in driving out of their driveways into a single lane of traffic and/ or a bus stop.The new mini roundabout will inevitably lead to jams in both directions as the unwieldy double deckers try to manoeuvre into a solid line of south bound traffic, if they are able to make such a sharp turn at all.By extending the central reservation down to Castle Yard emergency vehicles will be unable to over or under take stationary traffic. The proposed location is already served by the 214, 143 and 603 buses as well as school pick up buses, to add a number of parked 271 buses will at times turn the road into a bus garage. The noise at night of the 24 hour 214 is already very disturbing as they run their engines or rev up, it seems unreasonable to exacerbate this by adding the more frequent and noisy 24 hour 271.These buses are large and unsightly and would ruin the appearance of a historic part of the conservation area of Highgate. It is difficult to understand how this costly project has gained the backing of yourselves or the Highgate Society, both of which are meant to protect the Village. The benefit of freeing up a small space next to the already large open space of Pond Square compared to the problems set out above seems very minor.I should also add that many residents were unaware of this proposal as TFL failed to send us the leaflet. Hi. You make a lot of points and from my post you will appreciate that I do not agree with all of them. I do hope you will raise them with TfL. The forum does support the thrust of the scheme but has many issues of detail to raise with TfL. Our response will cover many of your points – it is vital for example that provision is made for deliveries to the pub, emergency vehicles etc. As with anyone else who has commented, you are always welcome to join the Forum or Highgate Society in the fight for better bus services for Highgate. On the revving of engines at night – or any time – TfL makes it clear to their drivers that engines must be off at all times when parked. If the drivers are not doing that, do let TfL know and our experience from other places is that practice does change. There is a strong feeling that the new mini roundabout should not be a mini roundabout but just a turning for buses. The Forum will be arguing for that change to the TfL plan. As the pupils will continue to cross outside St Michael’s School this will be keeping the buses and children about as far apart as possible. We do not want anyone to be “fair fodder”. The mother of one of my friends was killed while crossing North Hill some years ago and I have spent more hours than I care to count trying to improve safety on our streets. The stats for Archway Road and the alternative route through the village make grim reading. For what it is worth, I am also told that the double deckers have a tighter turning circle than the 214s. Having achieved this, the group felt they had to make use of these new provisions and that setting up a Neighbourhood Forum was the way forward. They also felt it offered a democratic way of putting together a plan through which the local community could influence future development. I’m rather surprised to see that no one has raised the point that this area is relatively unchanged since the London to Edinburgh MCC Trials started from exactly this place almost 100 years ago…………… I have in my possession many photographs showing this area, and the large crowds that used to congregate here in 1919 et al, to see the cars and motorcyclists off every Whit Friday. Please keep this road as is……and save some important Highgate history! !